George Graham Reviews Etta James' "Let's Roll"
Classical music and blues share a curious characteristic. Each genre celebrates both youthful prodigies and venerable performers. Classical music has had its youthful sensations, from Mozart to the current day, while in the blues, teenage performers like Johnny Lang have sold a lot of recordings. But in both forms, performers tend to get better with age. Classical performers learn more of the subtleties of the music, while for blues musicians it's the same case, with some of life's experiences manifesting themselves in the music. This week, we have the latest release by a real veteran blues singer, who in her mid-60s, is at her peak, and also proving remarkably prolific. 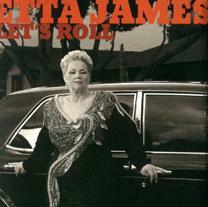 She is Etta James, and her new release is called Let's Roll. Jamesetta Hawkins was a bit of a prodigy herself, beginning her performing career at age 14, when she was discovered by Johnny Otis, who gave her her stage name. Her first record was in 1955, and five years later, she first hit the top 10 with All I Could Do Was Cry. She continued to record and perform extensively, achieving one of her biggest early hits in 1967 with Tell Mama. But a troubled life, bedeviled by drug problems and abusive relationships, caused an extended hiatus in her career. After exorcising her devils, she made a triumphant comeback in 1987, with the acclaimed album Seven Year Itch. Since then she hasn't stopped. Let's Roll is at least her tenth release since then, during which time she has won numerous W.C. Handy blues awards, as well as a Grammy for her 1994 jazz-oriented collection of Billie Holiday songs called Mystery Lady. While Ms. James is not a very prolific songwriter, her compositions have been covered by other artists, and she also turns out to have a great ear for picking worthwhile songs by others and making them her own. That is the case on Let's Roll. She draws on such composers as Delbert McClinton and Nashville writer Gary Nicholson to come up with a great collection of songs, most of whom have a degree of lyrical cleverness that only adds to their appeal. Unlike many performers with lengthy careers, and who could be excused for sticking with their particular sound and putting it to best advantage, Etta James is stylistically restless. She has done the aforementioned jazz album, served up live recordings, and gone to Nashville absorbing the influences there, including a little steel guitar on her 1997 release Love's Been Rough on Me. She has worked with various studio musicians from different backgrounds, and recorded material ranging from bruising blues to mellow ballads. This time around, she records with her regular touring band, including her sons Donto and Sametto James, and does an album more toward straight rock & roll. And, as usual, Ms. James rises to the occasion, showing that time has not in any way diminished her vocal power, and her ability to convey a song with a combination of conviction, class and that nod-and-a-wink that has makes her one of the most compelling singers on the scene today. The result is an album that never stops. While big production blues albums with top-flight studio musicians can be gems, putting a veteran performer in the studio withf her regular touring band, can make for a tight, energetic performance, and this CD is proof of that. Ms. James also served as producer of Let's Roll herself. Joining her, in addition to her drummer son Donto and her bassist son Sametto, are David K. Mathews on keyboards, Bobby Murray on electric guitar, and Josh Sklair, who adds some interesting touches such as acoustic guitar, and banjo, as well as playing harmonica for the group. There is also a three-piece horn section. The sound of the band can sometimes recall the Rolling Stones at their best. Etta James is one of those venerable blues performers who only seems to get better with age. But unlike others, who can be excused for slowing down a bit upon reaching what for most people is retirement age, she seems to be pushing ahead at full steam turning out a new album just about every year, and touring constantly. Now, she has created one of her most energetic and powerful albums in years, drawing as much on rock as the blues, and summoning both the earth-moving power in her voice, and her flawless delivery. Recording with her regular touring band including her two sons, producing the CD herself, and being able to draw on some great songs makes Let's Roll a blues and rock album that just about has it all. Sonically, the CD makes no attempt at being a delicately-recorded audiophile album, it's loud and has plenty of power, but the sound is reasonably clean, and the mix puts everything in the right place. About the only thing I would quibble with is the rather processed, almost artificial sound of the drums, which is a little odd given the fact that the original recording engineer on the California sessions is drummer Donto James himself, though the mix engineer is pop producer David Z, who has worked with Prince among others. We'll give it an A-minus. It's hard to pick a best album among Etta James prolific and stylistically-varied output of the last decade and a half. Every CD she has done has had its strong points. But the sustained energy level, and all-around great performances by Ms. James and her band, make Let's Roll another highlight of her impressive career.